Today I finished the base game of N++. Yesterday I beat the hardest difficulty of Butcher. I wanted to capture my thoughts on this while they're still sharp. Both games are, in effect, about the same thing. Persevering in the face of ever-mounting odds, refining your skills, and coming out on top. Then, you do it all again, only harder. The way they go about this "message", however, is totally different, and will suit different people. 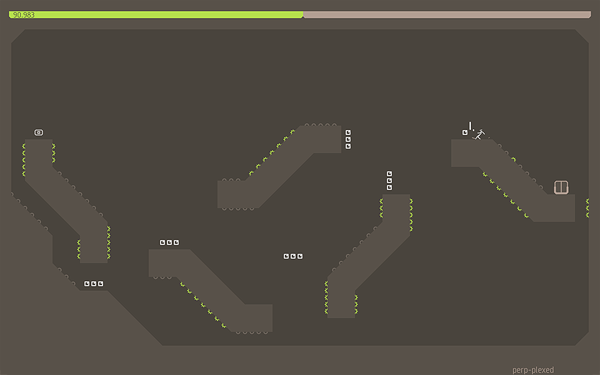 N++ is a game of joyful movement. You have a limited amount of time to move your ninja through the hazards of each level and reach your goal. Along the way you are tempted by gold that often leads you through more dangerous areas, for the reward of a better place on the global leaderboards. Throughout the game, you learn advanced jumping and dodging techniques - but these are not abilities of your character, these are abilities of yourself. The game teaches you the basics with an introduction that whets your appetite for a real challenge. Upon starting the base game, you are presented with 20 independent episodes to tackle. This ensures that, at least for a while, you cannot get truly "stuck" on some problem level - unless it's the only one you haven't beaten, you can always refine your skills on another challenge and come back fresh and ready. If the student is willing, there is always something more to learn. On completing each episode, another, harder episode is unlocked. The game's difficulty slowly builds into a blisteringly precise crescendo. Butcher is a game of pragmatic improvisation. You must storm (in succession) five hideouts full of soldiers, traps, and killer robots, slaughtering everyone that stands in your way. Death can come very quickly and you must react to enemy placement, movement patterns, and reactions to your invasion. Over the course of the game you gain more weapons that present new tactical options - but, similar to N++, the biggest improvement comes from your understanding and execution of the game. Where they differ though, is that Butcher offers no other helping hand than your slowly building rage at the hapless minions standing in your way. There is no kind introduction, no option of a side channel. Initially, you will feel sympathetic when your enemies scream with agony as you mow them down. By the end, you will be waiting for their screams as confirmation your rounds struck home, as your eyes scan the room for your next victim. 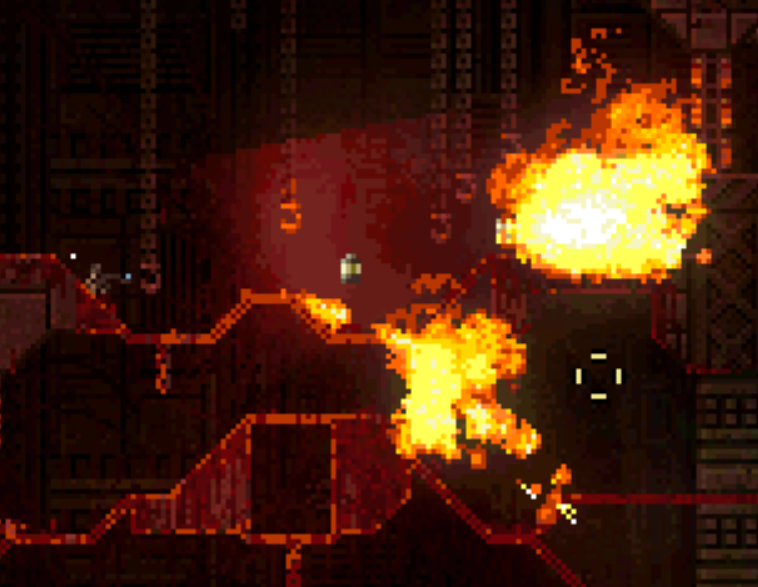 Butcher fosters the murderous robot inside you, and puts it to good work. It's not a game for the faint of heart. Both games require you to take many attempts at a challenging level (and there are plenty of challenging levels) - testing the waters, forming a plan, and revising as you learn more about your situation. It is only through perseverance that a player can succeed at either game. Both games will test your mettle, can be very frustrating, and take time to learn - but they are immensely rewarding if you can rise to the occasion. This has all, happily, reinforced my confidence in the design of Note Guru. I'll talk more about that another time!